At Wit's End: How Much Is Enough? The end of July is nearly upon us (man, that went by quickly), and as I'm want to do at the end of every month, I thought it was a good time to check my progress. It's actually kind of hard to believe that I sent my manuscript out to my editing team on the fourth; it's only been three weeks! Also somewhat amazingly, in that time, I've written 27,500 or so words on my second novel, and 2,500 words on a shorter work in that same amount of time. Combined with all of the business-plan drafting and assorted business odds and ends of trying to indie publish a novel this month, and I think it's an "okay" pace. Not great, just "okay." "What? You're crazy! That's, like, SO much writing!" Actually, it really isn't. I've been getting better about writing on the weekends and whatnot, but my output over the last few weeks has been just under 1,500 words per day. That's decent, but not quite the pace I think I should be at. Stephen King writes at least 2,000 words per day, every day of the year, according to his excellent book, On Writing. I'd be surprised if he didn't end up writing more. All of the greats treat writing like a job, and while I'm devoting full-time hours to this pursuit, I always feel like I could be pushing myself more, doing more, learning more, wringing just a little bit MORE out of every hour of the day. It's an odd feeling that leads me to today's topic: just how much is enough? I mean, I write (and that means actually sit in the chair and write) an average of 4-6 hours per day, every day of the week, plus maybe an hour or two each day on the weekends. That's a good amount, to be sure, but it doesn't count the time I spend thinking about wording, and plot, and story, and jokes when I'm doing anything else, which is pretty much the balance of my waking hours. I apologize, but if you've talked to me at all over the past few months, there's a good chance that, during our conversation, I lapsed into fleshing out a character in my mind, or coloring a specific scene, or plotting out the next couple of books. Fortunately, I have an insanely compartmentalized and arcane pretty good memory, so a lot of this stuff just sits in my head, as my mind ruminates on it throughout the day. The stuff that doesn't fit there goes in my notebook or phone for easy access later. I've been waking up earlier (I'm on about 6 1/2 hours of sleep a night now), and getting a better start each day. I've been eating much better (thanks, Paleo!) and working out much more efficiently. I have more energy, and my mind is clearer than it's been in a while. Don't get me wrong; I still have plenty of fun and get away from it for a while. I've tried to golf once a week or so over the past few months; that's one time where I actively have to focus on something else, so it gives my mind a bit of a break. I go for long walks, but those are usually a way to brainstorm new ideas. I try to have a night or two every week where I can just relax a bit and unwind. But still, even these small allowances have left that voice nagging in the back of my head: am I doing everything I can to make it? Is this as much as I can possibly give to this pursuit? Am I putting in as much work as I possibly can? I already do a lot, but how much is enough? What level of work will tip the scales from "failure" to "success?" Am I doing that much yet? I doubt it, but I also doubt that I'll ever reach a point where I think "okay, now I'm doing enough." I always feel like I could do more. Until anyone says otherwise, the best I can do is continue to push the boundaries and ramp things up. Keep writing and writing and writing and hopefully one (or, actually, a number) of these projects will succeed. Keep tapping away, letter after letter, word after word, and eventually I'll have created something. I guess the question is whether that something will be worth reading? Or would I be better off hiring a couple of chimps to bang away at my computer all-day, every day? (Why two chimps? Obviously so that they could work in shifts--I'm not a monster). This blog is meant to keep me accountable and on-task, so I apologize if this seems like the delusional rantings of a half (quarter? Fifth? )-sane individual. But if nothing else, it should give you some insight into my creative process, and hopefully can inspire some of you to action in creative endeavors. And hey, if not, I think I can get a pretty good deal on a couple of chimps to do it for you. D.J. Gelner is a fiction and freelance writer from St. Louis, Missouri. Follow him on twitter (@djgelner) or facebook (here). 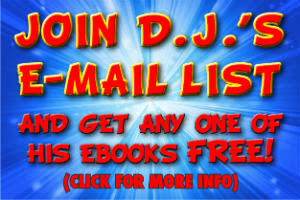 E-mail him at djssuperblog@gmail.com. You can also listen to his podcast (Bottle and Cans) here.